With a stay at Villa Sandpiper, you’ll be able to enjoy the very best that Mauritius has to offer. Indeed, this villa boasts plenty of space for you to spread out in and relax in Paradise Island. 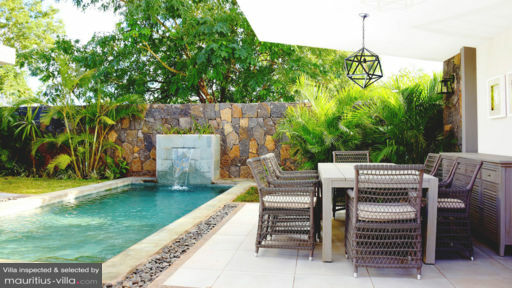 Offering an unobstructed view of the Moka mountain range or the glistening Turtle Bay, this villa is perfectly appointed for families and groups who want to enjoy a tranquil albeit lavish holiday in Mauritius. Because the villa is located in the scenic south-western coast of the island, you will be able to enjoy the many picturesque attractions in the nearby surroundings. Guests of the villa will also receive a plethora of services to ensure that their vacation runs as smoothly as possible. In Villa Sandpiper, you can take your pick from three spacious and beautifully-appointed bedrooms designed in such a way so as to help you enjoy a restful slumber before waking up to yet another sunny day in Mauritius. In the master bedroom, you’ll find a king-sized bed as well as an en-suite bathroom which boasts an open shower as well as a bath tub. The second bedroom also features an en-suite bathroom as well as a queen-sized bed, while the last guest bedroom includes two twin beds and an en-suite bathroom. All three bedrooms are fully air conditioned. There’s also a safe in the master bedroom where you can stow your valuables during the entire duration of your holiday. 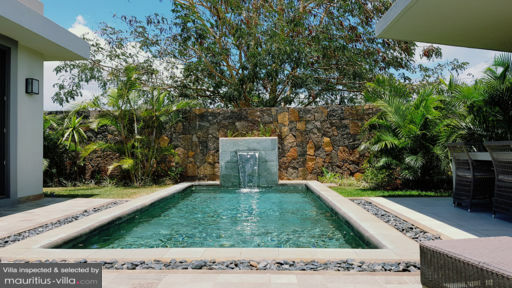 Nestled in a spacious yard, Villa Sandpiper boasts a large swimming pool with cascade, offering the ideal respite from the notorious island heat. A spacious outdoor patio adds extra space for you to entertain while enjoying an Al Fresco dinner with your friends and relatives. The perfectly manicured garden offers the ideal retreat to guests who want to relax on the sun loungers with their favorite drinks and a good book. 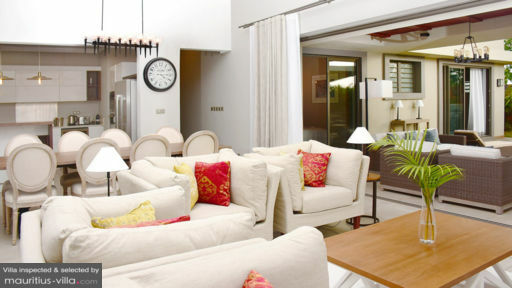 The living areas of Villa Sandpiper feature classic home comforts to feel like your very own house. There’s a spacious living room with a five-seater couch and a wall-mounted LCD TV with satellite channels. While there’s an outdoors dining area, you’ll also find an eight-seater dining table to comfortably accommodate every guest. Because this is a self-catering villa, there’s also a perfectly equipped kitchen, complete with food processor, full crockery and cutlery sets, cooler box, Nespresso machines, dishwasher, toaster, kettle, 2 Doors fridge, freezer and oven. With a secured parking lot and 24/7 on-site security agents, you can put your mind to rest as you enjoy a blissful stay at Villa Sandpiper. Numerous services have been set up at your disposal. Consequently, a housekeeper will show up every day from Monday to Saturday to clean and maintain the villa, setting you free of such tedious tasks during your holiday. On the resort grounds, you can also enjoy numerous community facilities including outdoor pools, tennis courts, spas, fitness areas and a private clubhouse. A stay at this villa places you near the spectacular coast of Tamarin, which is one of the best places in Mauritius for dolphin-watching, especially if you head out to sea early in the morning. Nearby, you’ll also be able to explore the historic Tour Martello, an ancient stone fortress which was built back in French colonial times and now houses an interactive museum.